The NPA has expressed anger at the latest fall in the Standard Pig Price at a time when pig markets generally are buoyant on the back of increased demand from China. After three weeks of small increases, the EU-spec SPP recorded a week-on-week decline of 0.23p, to stand at 137.73p/kg last week. The measure remains well below year earlier levels. AHDB said the disappointing prices might be linked in part to uncertainty over Brexit. Last week, it cited industry reports suggesting processors have been stockpiling product in cold stores in order to prepare for Brexit, which is having a negative effect on demand. This week’s AHDB report said estimated slaughterings were up on the previous week to 176,000 head. A rise was expected after reports of an issue at one processor last week, causing pigs to be rolled into this week. Carcase weights increased to average 85.22 kg which could also be reflective of pigs being rolled. The EU-spec APP, reflecting recent trends in the SPP, increased by 0.39p to 143.16p/kg in the week ending March 23. Nonetheless the fall in the SPP comes as a disappointment at a time when the EU market is very much on the up due to additional demand from China, reeling from the impact of its African swine fever outbreak. “After a mushrooming boost in demand for pork imports into China, the pig market is booming throughout Europe,” the latest EPP (European Pig Producers) email update stated. A number of EU member states are recording ‘clear increases’, including Belgium, Germany, the Netherlands and Austria, which all recorded increases of around 10-11 eurocents/kg. More moderate, but still significant increases were seen in France, Denmark and Spain. Meanwhile, US pork futures prices have soared since mid-March as the likely scale of Chinese import demand over the coming months becomes clearer. 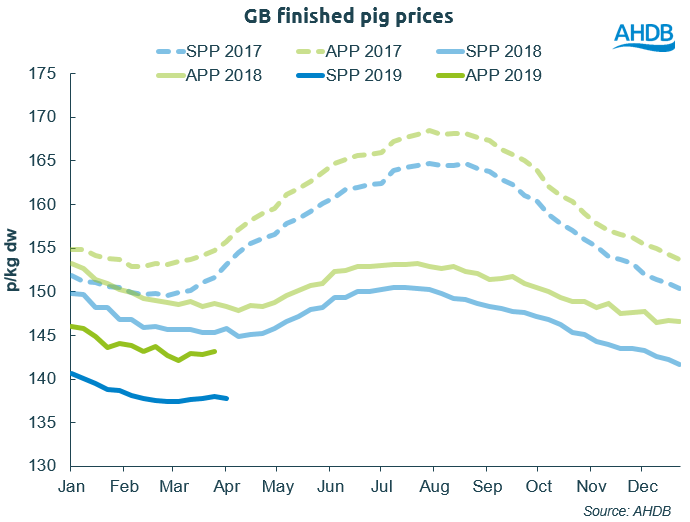 Most analysts are predicting a generally positive impact on pig prices for the remainder of 2019. Speaking at the AHDB Spring Regional meeting in Newbury on Tuesday AHDB analyst Bethan Wilkins said the premium between UK and EU prices had grown over the past few months, making EU imports more competitive versus domestic product. But recently the gap has started to narrow and rising EU prices should support higher UK prices, she said. NPA chief executive Zoe Davies said: “It is very disappointing to see a drop in the SPP at a time when all the indicators appear to be supporting a price rise and every other market appears to be heading in that direction.